It's a Scrappy World: Christmas in April with OSAAT! I am trying to get ahead for next year (so maybe I can actually get my cards sent out!) and the folks at One Stitch at a Time are helping me with that goal! They have a Christmas Club going on, where every 3rd Sunday they ask one of their talented design team members to pick a theme of their choice and participants can create things to fit that theme. At the end of the year you'll have at least a dozen cards and they will give you something cool as a reward! Pretty cool and generous hmm? Go check out all of the details at OSAAT! Hope you like my 'Sassy' Christmas card featuring an image from Bugaboo Stamps! 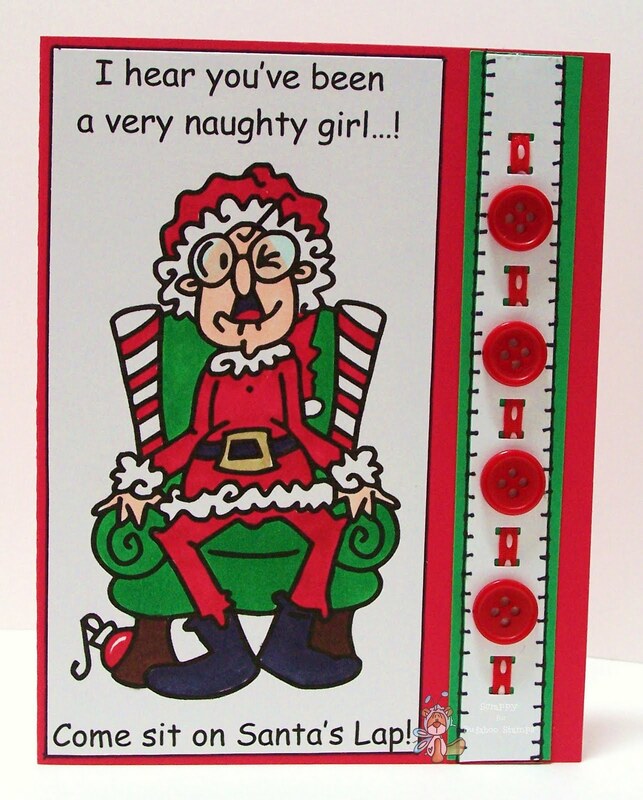 Fab sassy santa wonder how sassy your recipient will be , love it thanks for joining and sharing with us all at OSAAT. What a cool card Scrappy ! Love the border with the buttons ! Fab !